Maintenance-free decks are so named because they do not need to be stained or sealed. While less cost-effective than cedar, this durable, easy option is the top choice for many homeowners. 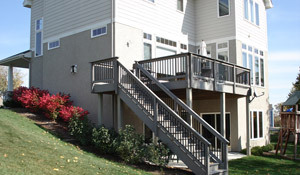 Maintenance-free decks are made of a composite building material composed of a combination of plastic and wood fiber.